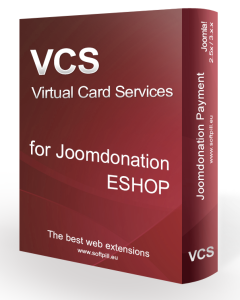 VCS (Virtual Card Services) for Joomdonation Eshop payment method released. Virtual Card Services was established in 1996 to offer a solution to the mail order market that found conventional methods of securing large volumes of credit card payment cumbersome and costly. With more than 50 years’ collective experience in developing and implementing credit, debit and smart card processing systems for a major card issuer in South Africa, VCS was quick to identify the niche presented in providing a solution that exactly meets these needs.